Hi, I’m Caroline, welcome to my website. 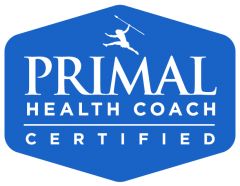 I’m a certified Primal Health Coach and I’ve designed this site not only to tell people about the primal health talks, workshops and coaching programs I offer, but also to try to answer some of the questions I get every day about what ‘primal’ means when it comes to food and lifestyle choices. → I believe that moving away from very carbohydrate-heavy, industrially-produced meals and snacks is a powerful tool in reaching health, fitness and body composition goals. → A real-food diet is quite a simple concept but not so easy to achieve in real life, in an environment where even sports and leisure centres offer predominantly sweet, fried or pastry-based foods. 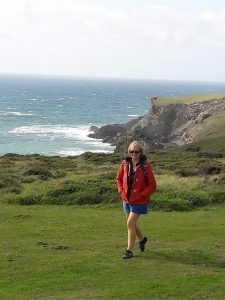 → Food is the starting point and its effect on us cannot be emphasised enough, but keeping our bodies moving – not necessarily in formal exercise classes – is very important if we are to keep our fitness as we go beyond our teens and twenties. Finding ways to move more in everyday life and developing strength and flexibility is not, as I used to think, just for gym enthusiasts and body-builders and young people. → I fell in love with the primal way of life: feeling sunshine on my skin, daylight in my eyes, grass under my bare feet, the smells of the seasons, the challenge of balancing on kerbs and logs, the pleasures of good food, sleep, conversation, walks, relaxation, meditation, prayer, gratitude, living in a community. All of this, of course, underlined by feeling in good enough shape, fitness and health to enjoy it.